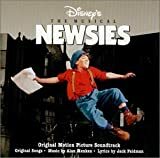 Accueil Bande originale Paroles Chansons The world will know – Paroles de la chanson dans “Newsies”. The world will know – Paroles de la chanson dans “Newsies”. Interprétée par Christian Bale et les crieurs. They think they got us. Do they got us ? Even though we ain’t got hats or badges. We’re a union just by saying so. And the world will know. What’s it gonna take to stop the wagons ? What’s it gonna take to stop the scabbers ? We’ll do what we gotta do. Until we break the will of mighty Bill and Joe. Have we got news for you. Now the world will hear. What we got to say. But we’re makin’ ’em today. And our ranks will grow. And we’ll kick their rear. When the circulation bell starts ringin’. Will we hear it ? What if the Delanceys come out swingin’. When you got a hundred voices singin’. Who can hear a lousy whistle blow ? That this ain’t no game. That we got a ton of rotten fruit and perfect aim. So they gave their word. But it ain’t worth beans. What “stop the presses” really means. And the day has come. And the fear is gone. And our name is mud. And the strike is on. Pulitzer may own the World but he don’t own us. Pulitzer may crack the whip but he won’t whip us. And the world will learn. And the world will wonder how we made the tables turn. And the world will see. That we had to choose. That the things we do today will be tomorrow’s news. And the old will fall. And the young stand tall. And the winds will blow. And our ranks will grow and grow and grow and so. The world will feel the fire. The world will know (reprise). When you got a million voices singin’. And the world will feel the fire.